To truly develop their game players need to practice outside of team training sessions, which is why we have created this folder of solo drills and videos, complete with exercises that can be done outside of the team sessions. These individual drills and videos show your players the correct techniques so they can practice basketball speedy cuts, driving dribbling and accurate shooting on their own. 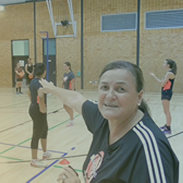 With ball handling exercises including the mikan drill, zig zag dribbling, jump shot and shooting drills this category has drills and videos you can use for personal development, warm ups and cool downs.